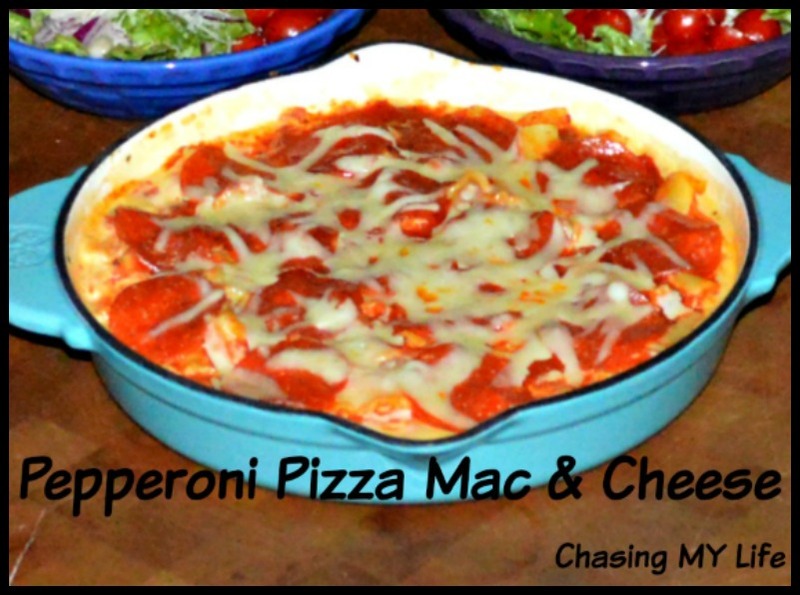 I found A recipe for Pepperoni Pizza Mac & Cheese in the recent issue of Cuisine at Home. It was NOT what we had hoped it would be (though it was good) so we made a few changes to help it be the GREAT recipe we thought it was going to be originally. Prepare pasta per package directions. Drain. Set aside several pieces of pepperoni for the top. Mince the remaining pieces of pepperoni. In a large deep oven proof skillet heat the oil over a medium high heat. Brown the sausage and minced pepperoni. Remove meats to a paper towel lined plate to absorb the grease. Reserve 1/4 cup of the drippings. Sweat the bell pepper, garlic, onion, oregano and red pepper flakes in the drippings until softened. Increase the heat and whisk in the flour until vegetables are well coated. Whisk in milk, stirring until smooth. Bring to a boil, stirring constantly. Reduce heat to low and gradually add Provolone, Cheddar and Parmesan cheeses whisking until smooth. Fold in Pepperoni, Sausage and Chicken pieces until well coated. Top with reserved Pepperoni pieces and Mozzarella cheese.